Middle school-aged children can sometimes have a short attention span regarding health and fitness. The trick is to display how fitness can be fun and interesting by thinking up new games and activities beyond typical sports-related physical education classes. 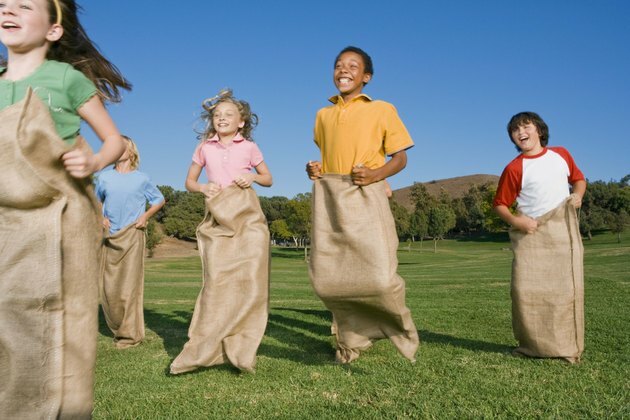 By teaching middle school children new games and activities, fitness becomes accessible for those children who may not be as proficient in sports like soccer and football, and the games can be simple and inexpensive to run. Mixing physical fitness with learning provides double the benefits for your middle school children. Card Laps is a game where the teacher or supervisor holds a deck of cards at the start of a track, notes Education World. The children run laps, collecting one card for each lap they run. At the end of 20 minutes, children are instructed to make a math equation using the cards they have collected. It gives middle school children a way to track their success, along with offering the small reward of a card to keep them moving. Part of teaching fitness to middle school children is teaching the correct concepts of muscle tone, posture and form. These lessons will stay with the children as they progress onto high school and beyond. By using an overhead projector, show various pictures of gymnastics positions and challenge children to mimic the same positions on their own, using gymnastic mats for safety. Snap a picture of each child mimicking the position to compare to the original, and talk about form, function and fitness safety. Tennis is an excellent form of physical activity, but it can be difficult for younger middle school children to learn to correctly use a tennis racket. Help your students learn more about using a tennis court and tennis rules by starting with Throw and Catch Tennis, suggests the P.E. Central website. Instead of using a tennis racket to rally the ball, kids catch and throw a ball to allow for longer plays and for a beginner to learn how to play tennis. As your students become more proficient, you can introduce tennis rackets if desired. It's likely that middle school children are becoming more proficient in bike riding and skills. Teach your students about the importance of bike safety by creating a bike rally. Create an obstacle course with cones, and take time to talk about watching for traffic and other bike safety issues. Split your students into teams and compete in the race. Children can bring bikes from home, but if some students don't own bikes, invite them to bring roller blades or skateboards to participate.